The 2009 vintage in Ontario didn’t look like anything special as it unfolded in the vineyards, but when it was all said and done a beautiful thing had occurred — perfect conditions for that most finicky of grapes, Pinot Noir. 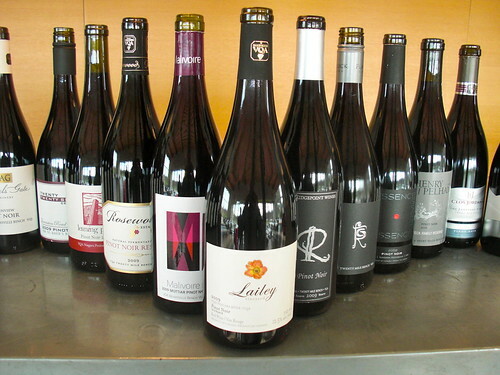 Some are saying the 2009 Pinots are the best ever made in Ontario. We decided to find out just how good they are across a wide swath of Ontario including both Niagara and Prince Edward County. Suresh Doss (publisher of Spotlight Toronto) and myself (publisher of this website) conducted the tasting in early December, one in a series of Twitter-inspired tastings made up of winemakers, bloggers and wine lovers held periodically in either Toronto or Niagara. All the Pinots were double decanted at least for hour before the tasting. Thanks, Nina!! 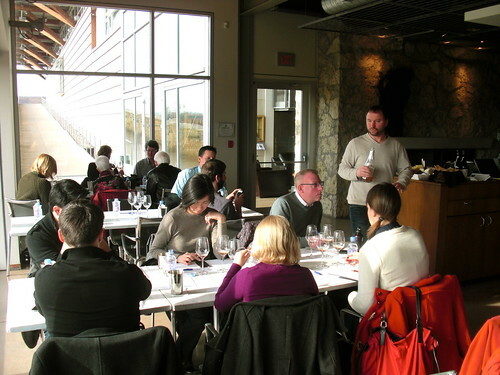 These events are held as non-profit tastings limited to 26 or so people, mostly those active in social media, who taste, tweet, discuss and enjoy a particular Ontario style or vintage that’s determined either from interest on Twitter or by us. bubbly, Ontario Cab-Merlot 2002, Canadian single-vineyard Riesling and Canadian Viogniers. For the #pinot09 (as it was hash-tagged on Twitter) event, hosted graciously by Del Rollo at the Jackson-Triggs Winery, in a tasting room with a beautiful window on the vineyards, we invited Norman Hardie assistant winemaker and vineyard manager, Mackenzie Brisbois, to talk about the conditions in Prince Edward County that made for a perfect Pinot vintage. We also heard from Jonathon Kuhling, general manager at Peninsula Ridge, Rollo on the Les Clos Jordanne collection, Ilya Senchuk, owner-winemaker of Leaning Post and winemkaker at Foreign Affair, and Coyote’s Run hospitality manager Brian Yeo. 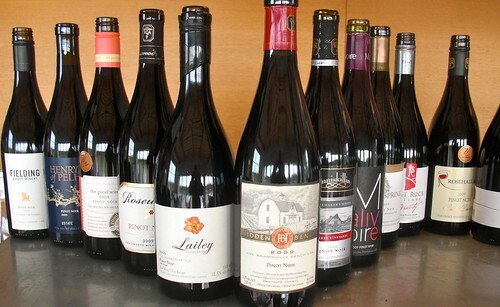 The vintage, which didn’t look like much as it unfolded in Niagara during the rather unspectacular summer of 2009, was surprisingly kind to Pinot Noir. 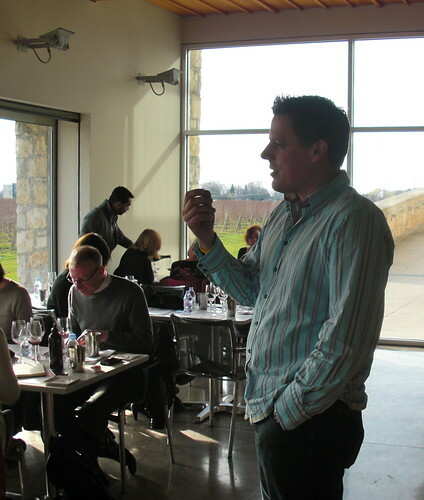 Norman Hardie assistant winemaker Mackenzie Brisbois talks about County Pinot. The growing degree days in 2009 were the lowest of the past six years. April saw a lot of rain; May was drier and the temperatures were seasonal. June and July were cooler than normal which helped prevent many of the typical disease pressures from developing. August was closer to seasonal temperatures. Disease pressure remained low, and was not an issue by the time the grapes were harvested. Pouring the sparkling Pinot flight. September was perfect for Pinot Noir with sunny, dry conditions and average temperatures of 22C and cool nights. Grapes had a long ripening period of about a month and were ready for harvest around the beginning of October. Acidity was high and sugar levels were around 22 brix. Harvest occurred under sunny and dry — but cool — conditions at the end of an Indian summer. It was an interesting afternoon of tasting nearly 40 different Pinots from top Niagara and County producers. 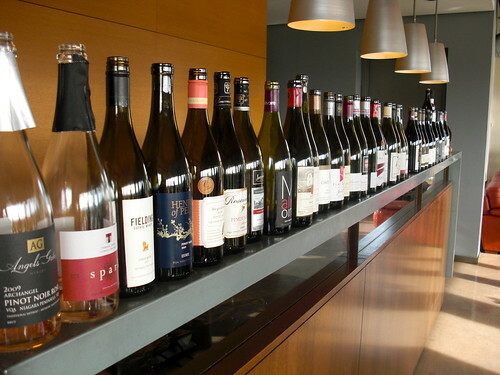 At the time of the tasting, most of Ontario’s Pinots had been released (or at least bottled and offered up for the tasting) with a couple of notable exceptions — Chateau des Charmes and Tawse, which are both releasing their Pinots this year. 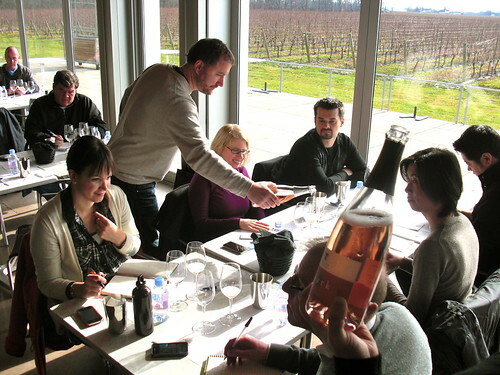 What the tasting demonstrated, at least to me, was a consistent elegance through most of the bottlings with refined and almost delicate touch to the Pinots that, in hotter vintages, can be over-extracted and weighted toward the earthy notes. Almost across the board, the wines are tight and youthful and deserve more bottle time, but would show well now with the right food match. In short, the 2009 Pinot Noir vintage is exceptional and wine lovers are advised to stock up on this surprising year for the heart-break grape. Here’s some of what we tasted, grouped into style and region (note: some of these wines have been previously reviewed and, as there were a couple of off-bottles at the tasting, they were, in fairness, retasted at a later date). Rosehall Run Cuvee County Pinot Noir 2009 ($22, 88 points) — A wonderfully balanced Pinot with cherry and raspberry fruits, violets and subtle oak stylings on the nose. It’s all about the red berries, cedar-oak notes and balancing acidity on the palate. Good value County Pinot. Rosehall Run Rosehall Vineyard Pinot Noir 2009 ($39, 91 points) — This top cuvee Pinot is farmed from the oldest vines on the estate and finished in French oak barrels for 16 months with 50% new barrels. There is no fining or filtration. The common thread with winemaker Dan Sullivan’s Pinots is the richness and depth of the red fruits he coaxes out of his grapes. Black cherry, raspberry, cranberry and strawberry mingle with cassis, sweet cedar spice and a nice mineral note. It’s silky smooth in the mouth with bramble and cherry fruit and subtle savoury notes, spice and touches of toasted oak and vanilla. All that and a vibrant acid core through the finish. 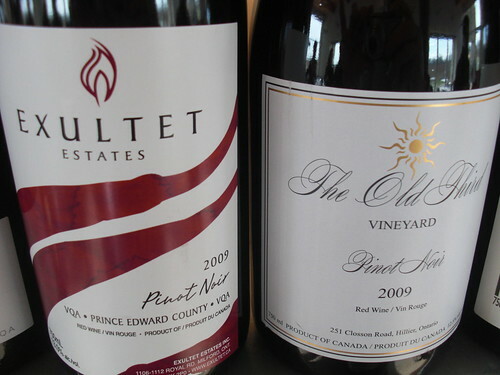 Exultet Pinot Noir 2009 ($55, 91 points) — A nose of warm cherry pie, leaning towards darker fruits, floral notes and wood tones. It’s highly expressive on the palate with rich, ripe dark cherry flavours, layered spice and firm acidity. One to hold and watch as it develops. Norman Hardie County Unfiltered Pinot Noir 2009 ($35, 92 points) — Norman Hardie consistently makes some of the finest and most personable Pinots not only in the County, but all of Canada. The 09 shows just how wonderful his wines can be. Bright, bold cherry and raspberry nose with just a hint of summer flowers and spice. It’s silky smooth on the palate, delivering bold and balanced red fruits and just the right amount of wood spice. Shows perfectly the elegance of the vintage. Lighthall Reserve Particuliere Les Grands Pinot Noir 2009 ($50, 91 points) — Only two barrels were made of this Pinot that spent eight months in all new oak. It shows ripe cherry, raspberry, smoke and bramble on the nose. Nicely structured on the palate with cherry-bramble-earth flavours to go with oak-inspired spices and ripe tannins. Racy acidity, firm and pretty Pinot with a long and graceful life ahead. The Old Third Pinot Noir 2009 ($35, 90 points) — Such a distinctive, terroir-driven Pinot that’s wild fermented and finished unfiltered and unfined. The nose shows rich cherry fruit, violets, raspberry and integrated spice notes. It’s silky smooth on the palate with lovely mineral and spice notes to go with the red fruits. Closson Chase Churchside Pinot Noir 2009 ($50, 93) — One of the top Pinots at the tasting in terms of structure and balance with an intense nose of ripe red fruits, cigar box cedar and spice notes. The rich fruits and spice are balanced nicely by firm acidity and ripe tannins. A complex and elegant Pinot that’s drinking fine now but will age and integrate further for many years down the road. 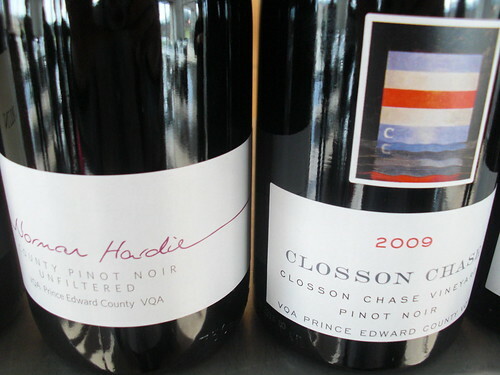 Closson Chase CCV Pinot Noir 2009 ($40, 89 points) — This single-vineyard Pinot is fermented with wild yeast and is unfiltered and unfined. It shows its wild side on the nose with fresh cranberry-cherry fruits, bramble and earth along with toasted vanilla spices. It’s rich and textured on the palate with red fruits, earthy bits, cigar-box cedar and mingling spice. Angels Gate Archangel Pinot Noir Rose 2009 ($25, 88 points) — Made in the traditional Champagne method with a strawberry-cherry nose with added yeast and freshness. Lovely berries on the palate, fresh and clean with a fine, vigorous bead of bubbles. 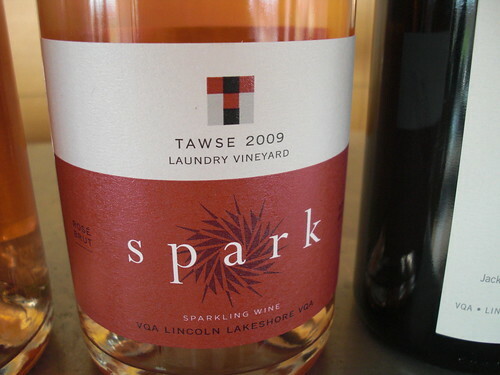 Tawse Spark Rose 2009 ($35, 90 points) — Made from 100% Pinot Noir from the Laundry Vineyard, this delicious rose is aged two years on the lees and made in the traditional method. Lovely brioche notes to start with meaty, yet soft, red fruits on the nose. I love the vigorous mousse on the palate with a basket of fresh red fruits and finesse on the with toast and vanilla through the finish. All with gorgeous acidity to refresh the palate sip after sip. 2027 Queenston Road Vineyard Pinot Noir 2009 ($35, 93 points) — All fruit is hand harvested, hand sorted and de-stemmed whole berry. It is wild fermented over 19 days and bottled unfined and unfltered. The youthful nose shows lightly spiced cherry fruit, truffle, cedar, floral, beetroot and vanilla. It’s amazing in the mouth with penetrating, persistent red fruits, vanilla, sweet oak and spice. It’s a graceful, elegant wine that shows its range of flavours and silky tannins through the finish. Henry of Pelham Speck Family Reserve Pinot Noir 2009 ($40, 91 points) — A bold expression of cherry, bramble, meat, currants and layered spice notes on the nose. It’s tightly wound at the moment, with firm structure, tannins and vibrant acidity but showing red and black fruits, mocha-clove spices and a smooth texture through the finish. A treat. The Good Earth Wine Company Pinot Noir 2009 ($25, 89 points) — Winemaker Andrea Glass has a thing for Pinot (don’t we all) and likes it fruity but still with a bit of that “Pinot funk.” She gets that funk, that earthiness, from her yeast selection. This is a lovely Pinot with a nose of red fruits, earth, cassis, vanilla and clove spice. On the palate, the earthy bits, spice and cran-cherry flavours are delivered on a racy spine of acidity. Henry Pelham Estate Pinot Noir 2009 ($25, 88 points) — A nose of cherries and strawberries with some earth and spice. Good acidity and firm tannins on the palate with red fruits and spice. Quite tasty through the finish. Cave Spring Estate Pinot Noir 2009 ($40, 91 points) — A beauty from the famed Cave Spring Vineyard, with a classic and refined nose of juicy cherry fruit, toasted spices, forest floor and beetroot. It’s legant and smooth on the palate with good structure and texture to go with ripe, rich red fruits and fine oak-inspired spices. Drink or hold. Angels Gate Pinot Noir 2009 ($24, 89 points) — From the Mountainview Vineyard at the estate’s Beamsville Bench property, this is another Pinot with excellent value. Lovely ripe nose of red cherry, raspberry, light toast and spice. Lovely mouthfeel with smooth tannins, cedar, red fruits and spice. 13th Street Essence Pinot Noir 2009 ($45, 91 points) — Didn’t winemaker JP Colas say you can’t make Pinot Noir in Niagara? Yes he did (sort of) and he explains (sort of) what he meant by that on the back label of this wonderful Pinot Noir, his first made in Niagara. All the classic aromas to start — mushroom, barnyard, forest floor, tobacco — then followed by cherry, cranberry, strawberry with a hint of spice. Very feminine and delicate with finesse on the palate, fine texture, silky tannins and well balanced acidity. Flat Rock Gravity Pinot Noir 2009 ($30, 91 points) — The Gravity delivers a seductive nose of cherries, plums, earth, cloves and other oak-influenced spices. On the palate it explodes with black cherry-raspberry, currants and sweet plums to go with fine tannins, minerality, toasty spices, and layers of complexity through the finish. Drink now or hold up to five years. 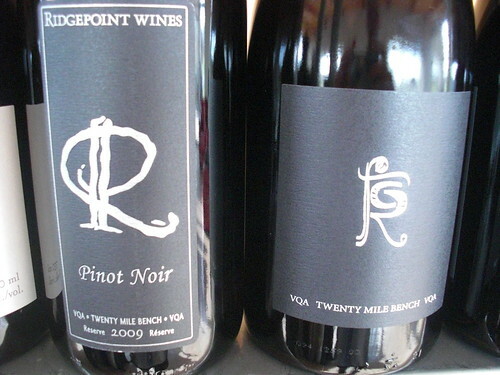 Ridgepoint and Flat Rock Reserve labels have a similar look. Flat Rock Reserve Pinot Noir 2009 ($45, 93 points) — A superb example of Niagara Pinot that combines elegance and power from a great vintage. 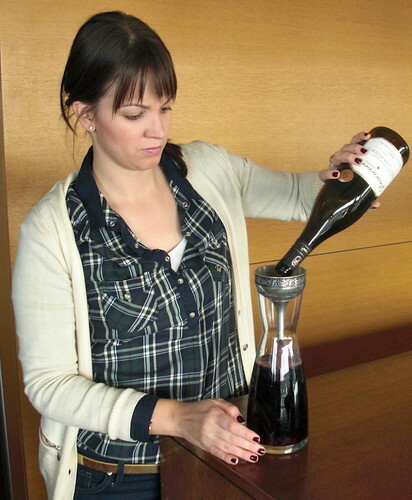 The reserve is Flat Rock’s top cuvee from its Twenty Mile Bench estate vineyard. The black cherry fruit is joined by earth, bramble and rousing spice notes that define this gorgeous Pinot. The red and dark fruits are harmonious in the mouth and a chorus of elegant spice, smooth tannins and acidity make this one heck of a wine to drink now or cellar for five or more years. A beauty. Lailey Old Vines Pinot Noir 2009 ($45, 90 points) — The Lot 48 Pinot was my red wine of the year for 2011, but this Old Vines (and the Brickyard below) version certainly help lift Lailey’s well-earned reputation for making suburb Pinots. Ripe, rich cherry aromas, interesting oak-clove spice and sweet vanilla notes are evident on the nose. The crushed black cherry, ripe raspberry flavours are balanced out by racy acidity and oak inspired spices to go with ripe tannins. Very nice. Lailey Brickyard Brickyard Pinot Noir 2009 ($35, 92 points) — The Brickyard Pinot is from the small estate’s, sustainably farmed vineyard that showcases perfectly both Pinot Noir and Chardonnay. Only 140 cases of this wine were produced. What a fantastic Pinot! Pretty aromatics that show fresh-picked summer cherries, raspberries and touches of pomegranate, spice and subtle oak tones. It’s just so silky smooth on the palate with forward red fruits and integrated spice already. A beauty. Coyote’s Run Red Paw Vineyard Pinot Noir 2009 ($25, 91 points) — Winery president Jeff Aubrey’s consistently favourite of the two single-vineyards, the Red Paw shows highly expressive creamy cherry fruit, spice, toasty cedar bits and some bramble-forest floor notes. Love the cherry pie flavours on the palate with touches of raspberry fruit, cedar, spice and roasted herbs. Coyote’s Run Black Paw Vineyard Pinot Noir 2009 ($36, 92 points) — The Black Paw vineyard only yields three tonnes per vintage of Pinot, the berries are smaller, they ripen before the other Pinot fruit on the estate and they usually have higher brix at harvest. It’s a gorgeously made wine with savoury cherry and strawberry fruit aromas to go with lovely spice and oak styling. It has wonderful texture in the mouth with raspberry, currants, plums, cassis and complex spice and oak. There’s a firmness to this wine and defined tannins that suggest improvement with time in the cellar. Del Rollo talking about Le Clos Jordanne's Pinots. Le Clos Jordanne Le Grand Clos Pinot Noir 2009 ($75, 92 points) – Fruit for this top Pinot in the portfolio is sourced from the best block of fruit located on the limestone-rich western side of the Le Clos Jordanne Estate Vineyard. The nose displays ripe plum, cranberries, black cherries, loam, cassis, flinty minerality, violets, spices and toasted oak-vanilla. It is dry yet persistent on the palate, still super-tight and waiting to open up, but still delivers wonderful red and black fruit intensity and balanced with wonderful spice and the elegance of fine oak. Wait on this, and it will return huge dividends. Potential for seven or more years in the cellar. Le Clos Jordanne Le Clos Jordanne Vineyard Pinot Noir 2009 ($45, 92 points) — Les Clos Jordanne Vineyard is the warmest of the estate vineyards, producing the ripest fruit. The nose shows raspberry, cherry and plum fruit with oak nuances and spice swirling about. It’s juicy and intense on the palate with complex red fruits and some currant and blackberry notes. The texture is dry with soft tannins and nice wood-oak notes on the finish. Needs a couple of years to show its full potential but decant for a couple of hours if you can’t wait. Inniskillin Three Vineyards Winemaker’s Series Pinot Noir 2009 ($20, 88 points) — This affordable Pinot stood out as the bargain of the tasting. A fruity, forward nose of cherry, cranberry, vanilla, spice and leather. Quite concentrated on the palate with pure cherry fruit, lovely balancing spice and a smooth texture. Drinking nicely right now. Hidden Bench Estate Locust Lane Pinot Noir 2009 ($55, 92 points) — A nose layered in cherry, raspberry, game, forest floor, smoke and spices. It is very tight on the palate with lively tannins and an array of bramble and red fruits, spice and vibrant acidity. It is rich, textured and youthful at the moment. Not released until next fall. 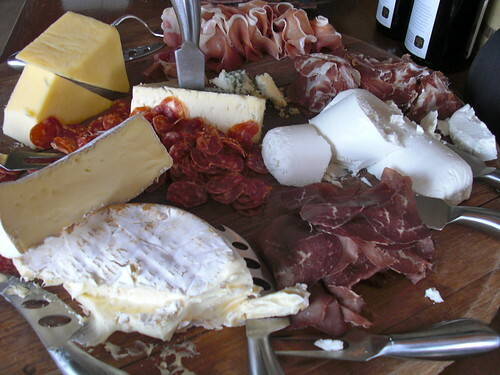 The chacuterie plate served by Jackson-Triggs. Hidden Bench Estate Pinot Noir 2009 ($38, winery, 91 points) — From a blend of Pinot Noir grapes grown in the three estate vineyards from a vintage that is proving perfect for cool-climate Ontario Pinot due to a warm late August and September. This wine spends 16 months in French barrels and is finished unfiltered and unfined and sees no pumping during the winemaking process. The nose shows concentrated cherry fruit, savoury notes, beetroot, barnyard and pencil shavings. In the mouth it displays tart cran-cherry fruit, wild raspberry, toasty spices, silky tannins en route to a long, creamy finish. Very interesting and inspiring Pinot from Beamsville Bench that will age beautifully. Rosewood Estate Reserve Natural Ferment Renaceau Vineyard Pinot Noir 2009 ($40, 90 points) — Rosewood’s top Pinot has a personable, distinct nose of meaty bramble and red fruits lifted by wood spice and violets. On the palate, bright red fruits emerge from the earthy-bramble flavours. It’s smooth and polished and shows length through the finish. Rosewood Estate Estate Pinot Noir 2009 ($20, 89 points) — The nose shows perfumed cherry-raspberry, blueberry and spice. It’s delicate on the palate, feminine in style, and shows restraint in the moth, with cherry fruit, spice and silky tannins. Made from estate and Niagara Escarpment fruit. Ridgepoint Reserve Pinot Noir 2009 ($30, 91 points) — A sturdy and tight version of Pinot that will reward with time in the cellar. The nose reveals rosehip, sour cherry, bramble and wonderful spice nuances. I love the earthy notes on the palate with warm, stewed cherries, vanilla, mocha and depth of flavours through the finish. Very smooth and textured Pinot. For cellaring at least for a couple of years. 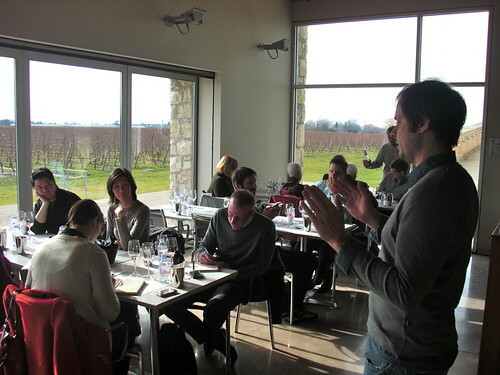 Ilya Senchuk talks about Leaning Post and Foreign Affair Pinots. Leaning Post Pinot Noir 2009 ($38, 89 points) – A complex nose of cherry-raspberry, bramble, spice and a subtle savoury note in the background. It’s best to decant this St. Davids Bench Pinot for an hour or so as it’s quite tight and youthful both on the nose and palate. In the mouth, wonderful cranberry-cherry-raspberry and red currant fruits are joined by silky tannins, complex oak and spice notes and earth/loam/bramble undercurrents. There are a lot of parts at play here so I would lay this down in the cellar for at least a year, maybe more, or enjoy now with food. Great first effort from Senchuk. Malivoire Mottiar Pinot Noir 2009 ($40, 91 points) — The fruit for this Pinot is from winemaker Shiraz Mottiar’s personal vineyard on the Beamsville Bench and is a blend of five different clones. The nose is all about rich, ripe and intense red berries that are nicely spiced with vanilla and oak. So delicious on the palate with defining red fruits, silky tannins and silky smooth all the way through the finish. Malivoire Estate Pinot Noir 2009 ($30, 89 points) — A big nose of meaty-earthy fruits and black cherry with supporting spice. It’s complex and structured with cherry-bramble fruit, sweet spice, gritty tannins and length through the finish. Stoney Ridge Excellence Pinot Noir 2009 ($29, 87 points) — Shows earthy-oak aromas, earth, cherry, raspberry fruits and spice. The fruit is clean on the palate with plenty of interesting oak and spice to balance it out. Foreign Affair Pinot Noir 2009 ($45, 93 points) — This is something a little different from the Crispino Vineyard in the Vinemount Ridge appellation that’s aged in French and Hungarian Oak for 14 months with 40% of the grapes dried appassimento style. A nose of black cherry, earth, sweet spices, plum and some game notes. It’s mouth-filling and texturally beautiful in the mouth with kirsch, raspberry, vanilla-mocha spice, smooth tannins, good acidity and a long finish. Fielding Estate Pinot Noir 2009 ($25, 89 points) — From the Jack Rabbit Flats Vineyard in the Lincoln Lakeshore appellation with a nose of ripe cherry, cranberry and lovely spice accents. 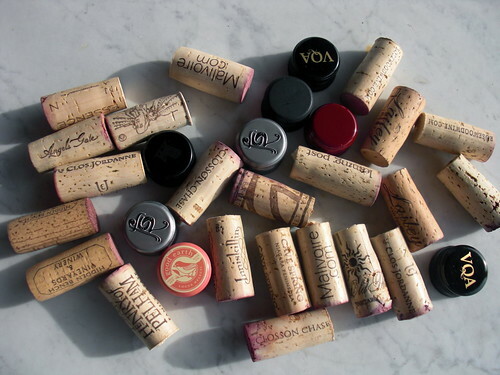 In the mouth the rich, red fruits are joined by sweet spices, toasted oak and plush tannins. Peninsula Ridge McNally Vineyard Pinot Noir 2009 ($25, 90 points) — Quite a forward and bright red berry Pinot that shows off the cherry-kirsch-strawberry fruit of the vintage. It is smooth and ripe on the palate, with red fruits, sweet cedar and vanilla spice, soft tannins and showing great balance now. Can drink or hold this wonderful Pinot Noir that’s a steal at $25.